Austin, TX: Should You Move There? Countless people are moving to Austin, TX every year to take part in this diverse and prosperous city—and perhaps you are too. As the state capital, it’s a thriving metropolis that isn’t short on personality and charm. Some of Austin’s greatest attractions include the city’s weather, culture and ample employment opportunities—but it’s not without it’s own inner city struggles as well. And that struggle is Austin’s growing crime rates. When it comes to the weather, it’s generally great in Austin— the average high in the summer is about 92 degrees Fahrenheit; the average winter low is around 42 degrees Fahrenheit with mild transitional months in both the spring and fall. Regarding the culture, Austin has it all. For starters, it’s a liberal, laid-back, friendly place that welcomes new residents and tourists alike. Since it’s fairly energetic, the one thing to definitely note is the vibrant music scene that draws many to its different music venues throughout the city. Music has such strong roots here that there are several large music festivals held each year: South-by-Southwest (SXSW) in March and the Austin City Limits (ACL) fest in the late summer. 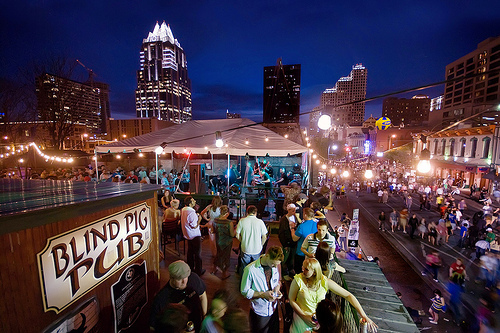 Attending those festivals really sheds some light on Austin’s musical roots. Austin is truly a melting pot, filled with different ethnic groups all coming together. There is strong Latino, African-American and Asian influence all throughout Austin. Reflecting these different groups are various museums, cultural centers and districts for anyone to take part in. Welcoming these, there are numerous cultural performances and parades held. So, to put it plainly, Austin welcomes everyone with open arms—and it’s clearly visible. Another thing that draws people to Austin is its many employment opportunities in a number of fields—predominately the tech industry (sometimes it’s even referred to as “Silicon Hills”), real estate, healthcare, and entertainment as well as federal and local government (after all Austin is the state capital). Regarding technology, there are a large number of companies that have either started or have made their headquarters in Austin. All in all, Austin brings in the second largest tech-revenue in all of Texas (Dallas-Fort Worth is the largest money maker in the tech industry). So it’s a great industry to be in—if those are willing to relocate. Austin’s numerous job opportunities make it the number one best city for jobs and the second best city for future job growth (according to Forbes). It seems like the city has always led the way with employment—having considerably lower unemployment numbers when compared to the national average (to give an idea, in 2015, Austin’s unemployment rate was 3.8% while the U.S. average was 5.8 percent—so 2% lower than the national average). Some of the most well known companies based in Austin include: Whole Foods, Dell, YETI Coolers and many others. In total, Austin has an estimated 2,056,405 people as of 2016. Like any location, there is a flow of people migrating to and away a city or town. One report indicates that on average, one American will move over 11 times throughout their life. There are many reasons for this, but currently, people are examining the migration patterns of today’s Millennials. They comprise over 40 percent of all movers—and are often seeking employment opportunities. Other reasons that factor in are affordable housing (which unfortunately, Austin doesn’t have and is a reason for out migration). Since Austin has so many job opportunities, people are coming to Austin in droves. A report by the U.S. Census Bureau’s American Community Survey studied the top cities that are seeing the largest in-migration, and Austin/Round Rock (a Austin suburb) came in at number 4. Over 8% of Austin’s population consists of new migrants. Altogether, Austin is the 9th fastest growing metro city in the country. Unbelievably, according to BizJournals, in 2016, 110 people moved to Austin every day—a net gain, despite any out migration. Over the next 25 years, Austin’s population is projected to double in size. One report by the FBI and U.S. Census Bureau studied the safest cities in the U.S. and Round Rock made the top of the list at number 6—one reason people migrate to the suburbs. However, in total, 7.11 percent of Austin’s population left the metro area. This revelation falls after Virginia Beach, Virginia (ranked number 1); Denver, Colorado (number 2); Richmond, Virginia (number 3); Washington (number 4); and Atlanta, Georgia (number 5). With that into account, as great as a city as Austin is, it’s not without its share of shortcomings, which leads some people to leave the city. As briefly mentioned, Austin does not have affordable and readily available housing—it’s a difficult market for both renters and homeowners alike. So even though there is a boom in employment, it’s difficult for people to find a place to live; it will only get worse in the years to come. Other out migration factors from Austin includes heavy traffic and construction (which goes hand-in-hand with the population increase). So essentially, the city is expanding drastically, but people are also leaving due to its need to expand and accommodate the flood of migrates coming in. When examining Austin’s overall TX crime rates, it’s 23 percent higher than the Texas mean and 38 percent higher than the national average. On a whole, Austin is only 25% safer than any other city in Texas and 25% safer than any other U.S. city. When looking at Austin’s number of violent crimes, it has a rate that is 6% lower than the state average, yet when compared to the entire U.S., violent crime rates are 6% higher. Examining things year over year, the number of violent crimes has increased by 9%– with more homicides than the city has ever experienced. Property crime in Austin is significantly higher than it’s violent crimes. It’s 27% higher than the state mean, and 43% higher than the U.S. average. Despite this, the year over year number of property crimes has decreased by 7%. And there is a 1 in 26 chance of becoming a property crime victim. Yet with crime on the rise, Austin still ranks among one of the U.S.’s safest metropolitan cities as number 26 of 50 locations. According to the 2016 FBI’s uniform crime reports, there are 2,252 law enforcement officers in Austin—meaning 2.7 officers per 1,000 residents. Compared to the Texas and National average, this is 10.1 % and 17.2% lower, respectfully. Austin is clearly a city that attracts all types of people for various reasons. If you are considering relocating there, you should weigh all the pros and cons of living in the metro area and surrounding suburbs. Keep in mind that despite it’s charm, the crime rates are above the national average (though the suburb of Rock Round is one of the safest areas in the country). Regardless of what you choose to do or city you end up moving to, you should never leave your safety up to chance. Investing in a home security system can further reduce the odds of becoming victimized.